WataugaWatch: What’s Going On With the Watauga County Board of Elections? What’s Going On With the Watauga County Board of Elections? As you should know, the administration of local boards of elections (BOE) changes with any partisan turn-over in the governor’s mansion. With the election of McCrory, the personnel of every county BOE becomes two Republicans to one Democrat. The governor’s office makes the appointments from lists of preferred candidates forwarded to Raleigh from county parties. Wait! Jim Hastings? 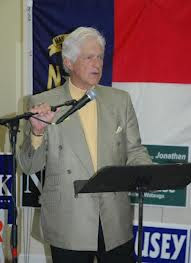 Not Stacy Eggers IV (“Four”), who has been the Republican member of the local board for several years and who was the top pick of the local Republican Party to take over the board under Republican rule. Something happened to upset that apple cart. We’ve had a problem with the dual roles Mr. Eggers was already filling, as both a member of the Board of Elections and as the county attorney serving the Republican majority. We were going to have an even bigger problem with Mr. Eggers as chair of the BOE, had that happened, since he would appear to have a glaring conflict of interest in managing an election process without also tilting the playing field to advantage his Republican bosses on the Board of Commissioners. Perhaps someone in Mr. McCrory’s administration noticed the conflict too. Instead, the governor has given us Jim Hastings, a flesh-eating partisan who has made his weekly radio show a virtual acid bath of nastiness sprayed on Democrats in general and on the Town of Boone in particular. Yeah, he’ll be fair! But he’ll also be pinched by North Carolina statutes governing the political activities of members of local boards of election. G.S. § 163-39, “Limitation on political activities,” will put the kibosh on Mr. Hastings’ radio career, though we suppose he might convert it to a cooking show. That’s not a particularly good look for a party chair. Funny enough, you and Jim Hastings are really the same person, just on different sides of the political spectrum. When I read that Hastings had been indicted for not filing income taxes for several years, I just naturally assumed he was a Democrat.